The bullish sentiment is showing no signs of abating, with Bitcoin trading firmly above the $5,000 mark and Ethereum on its path to reclaim the $200 level. However, those hoping to find signals of the future price action in metrics such as hashrate will be disappointed to learn that despite the rally, there has been little movement in the underlying rate. This of course, makes sense as the exchange trading aspect has little to do with the underlying mechanics of the blockchain, it is the by-product of price gains which tends to incentivize miners and other participants to enter the cryptocurrency market for physical contracts. It is worth keeping an eye on the shape of the Bitcoin and Ethereum futures curve, and the spread between front and back months. ETH contango may widen further. The most recent CME Commitment of Traders report (see table below) shows an interesting dynamic, especially on the asset manager side. Longs stand at 315 vs 35 on the previous week and short positions are at 89 vs 241 on the previous week. It’s worth pointing out that longs are at a record high for this category. 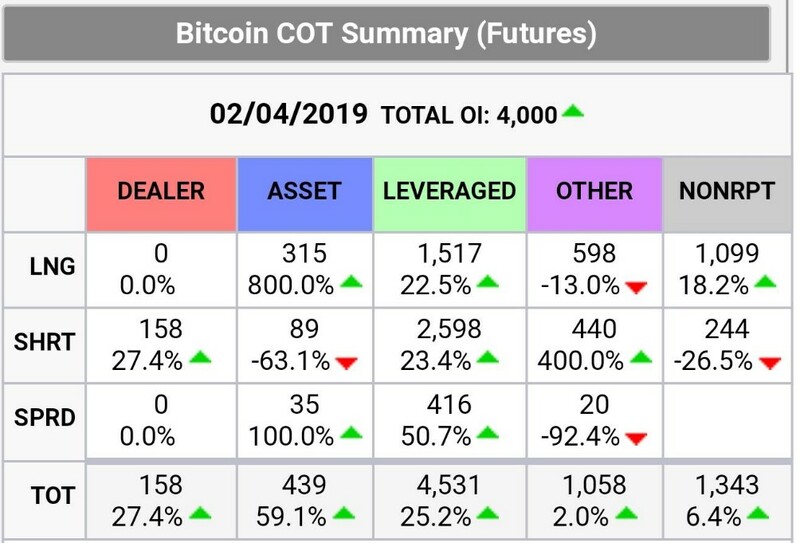 Last week saw a big increase in traded volumes; the CME pointed out that its Bitcoin futures reported a record trading volume on April 4 of over 22,500 contracts, which is equivalent to about 112,700 BTC. The previous record had been hit on February 19 and was reportedly over 18,300 contracts, equivalent to 64,300 BTC. Also, keep in mind that the CBOE is discontinuing its Bitcoin contracts, though there are many other vendors that facilitate futures trading where there are no reporting requirements. Buying on dips seems to be the strategy in vogue now. Despite the bullish sentiment, a Bloomberg article has pointed out that Bitcoin is at its most overbought level since its record highs of December 2017. As per the report, Bitcoin’s GTI Global Strength Indicator shows that BTC has not been this overbought since its price neared its record peak of $20,000, and similar patterns in the past have signalled multi-week-long downturns. In other news, G20 member countries will meet to discuss international cryptocurrency Anti-Money Laundering (AML) regulations on June 8 and 9 in Fukuoka, Japan. G20 central bank governors and finance ministers will take part in the meeting. The event will be focused on establishing a framework to combat crypto-enabled money laundering and terrorism financing. Litecoin (LTC) has since lagged behind the crypto market.